The bustle of excited chatter and the clinking of fine china, some of which have been passed down for generations, filled Jensen Hall as Honey Lake Hospice hosted its annual Afternoon Tea. Of the 22 tables set up for the Saturday, April 21, event, each featured a different theme: Unicorns, butterflies, magnificent hats and even family. Claudia Dunlavy’s table, aptly dubbed the sister table, as her two sisters Debbie Moore and Elizabeth Dunlavy, and some friends who are basically sisters, came to visit just for the event. The sister table, set in honor of Claudia’s mother, Margie Dunlavy, featured her grandmother’s green depression glassware as well as the fine Lamoges collection from her 1914 wedding. 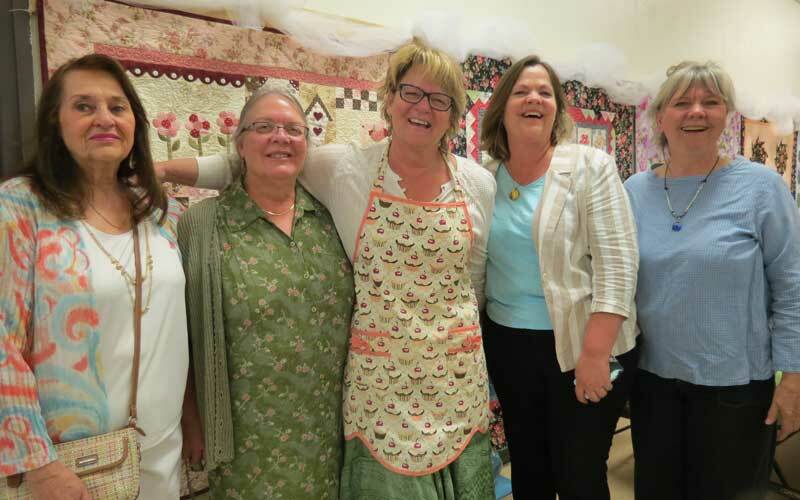 Jensen Hall was decorated with donated quilts and fine china as attendees at the Honey Lake Hospice Afternoon Tea event were served delectable treats and tea. About 150 people attended the event Saturday, April 21. The Afternoon Tea, which has served as a fundraiser for many years, nearly always sells out, said coordinator Mimi Rena. “People love it. We sell out weeks before, through word of mouth,” she said. 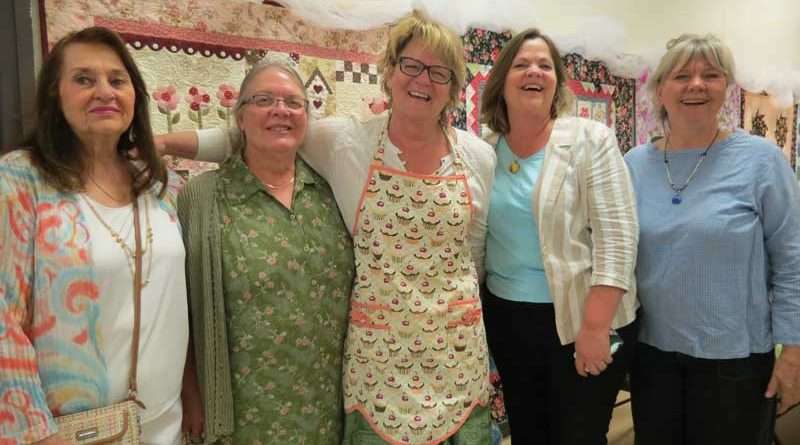 Set amongst a display of locally made quilts, the tables at the event each have a different host in charge of decorating it and serving the tea attendees. Annually, the event brings in about $5,000 on average for Honey Lake Hospice and serves as its largest fundraiser of the year. Honey Lake Hospice, founded in 2003, and a nonprofit as of 2007, is a corporation established to improve the quality of life for the terminally ill in Lassen County. The organization provides guidance and support to those dying and their families. “The corporation is run entirely by volunteers, and all services are free of charge. Our trained volunteers become part of a team working with dying persons, their families, primary caregivers, physicians, home health nurses and clergy,” according to the organization’s website. Throughout the duration of the event, attendees are served savory bites, including cheddar crackers and flavorful sandwiches, scones, accompanied with Rena’s lime and lemon curds and crème fraiche, and lastly, sweet desserts. Each table also gets to drink as much tea as possible, with options ranging from Windsor Castle black tea, Earl Gray, Rooibos chia, lemon ginger and more. Attendees could also enter raffles and participate in a silent auction. Through the years, the event has served as a fundraiser for Honey Lake Hospice, there has been some clear growth and interest in the event. Starting at the Montiocla Club with 10 tables, according to Rena, the event was put on by the local Tea Bag Society. They grew a little bit and moved to Eagle Lake Village, and grew even more to fill the Jensen Hall room. About 150 people attended this year’s event. “It’s just grown. It’s wonderful,” noted Cuypers. 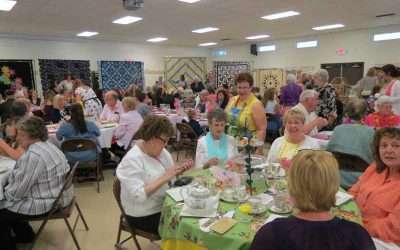 Ending this year, the event’s organizers noted just how much work is put in to make the tea a success, from all the business that donate items for the raffle and silent auction, the volunteers who help cook, bake, serve and steep tea and the quilters who donate their art to decorate the Lassen County Fairgrounds building. “It takes a bundle of us,” Cuypers said.